Did you miss our post in December where we shared our TOP READS for 2018? Standalone’s, duets and series! From sweet rom-com, to deeply emotional, to dark and gritty, there’s something for every reading taste! Many left their mark, however, these were the unforgettable stories that moved us in so many ways. Whether they made us laugh, cry or took us out of our comfort zone, these are the books that have stayed with us long after turning the page. CHECK OUT OUR TOP READS FOR 2018! Click here for all the details – or click the individual book cover below for our review. BLACK DAGGERHOOD FANS WILL UNDERSTAND!! So this happened in January! Last month we had the opportunity for me (Jenny) to read for the first time and for Gitte to re-read along with me, some of her all-time favourite books so we could discuss once I’d finished. When reading a book to review we always like to spend time discussing our current read, then discuss at length what to read next – you know depending on mood etc.…. As I was travelling and would be in and out of contact it was going to be difficult to sort out our next read, and so it was agreed that as I would have a lot of downtime hanging around airports and flying I would FINALLY start the Black Dagger Brotherhood series. This is a series I’ve been dying to read for years and one Gitte has nagged me to read for the same amount of time. So, I did…and OMG! I am in LOVE with these books. I managed to read 3 as I couldn’t stop (and Gitte wouldn’t let me stop) until I read Z’s book. NOW I KNOW WHAT SHE IS TALKING ABOUT! I’ve loved every book so far, but bloody hell…Z’s book! He is the ultimate alpha male! There was one scene where I thought I was going to faint! Those of you who have read it will know what I’m talking about, and those of you that haven’t, well…it’s one of the most frustratingly HOTTEST FAN YOURSELF scenes I’ve read. Talk about flooding your lady basement! WOW! When Gitte told me these books were completely addictive and like no other she was spot on! I get it now! I understand why she’s always so bloody excited every time a new book is announced/released. Yup, I completely feel her nutty excitement now! Now I feel like I can share in her excitement. Whenever she reads a new book in the series and I ask her how it was, she always starts with “bloody hell I wish you had read these so you could feel how I do right now” well now I’m beginning to, and I can somewhat share in her excitement even if I’m not up to book 17 like she is! If you want to know anything BDB related, Gitte is your woman! She lives and breathes this series and is always up to chat to fellow BDB fans new and old! 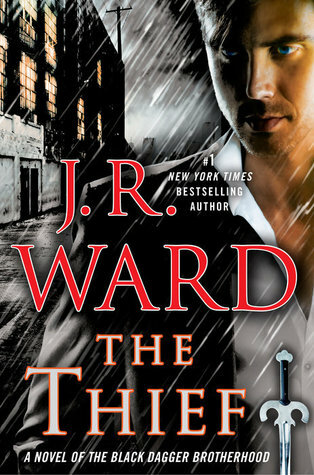 Check out her latest review (spoiler free, of course) for The Thief (Book 16) and don’t forget to check out our Black Dagger Brotherhood Series reading order. 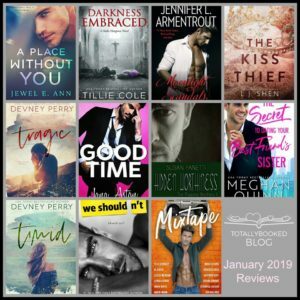 Did you see the books we read, reviewed and loved in January? Check out our spoiler-free reviews for some fabulous books to add to your TBR’s! We’ve had another varied reading week! Check out the books that have been making our book hearts race so far this month! Plus, check out what we’re currently reading. And coming up we’re so excited about our next few reads, and can’t wait to dive in! We only wish we could pause real life and just sit and read. Looking at our Kindle TBR’s are making us giddy with excitement! Oh wow, the prologue had us in tears – this book is going to be emotional! This is Jacob’s book, Ren and Della son from The Ribbon Duet, one of our top reads from 2018, and oh the emotion…we’re already feeling this book deep in our souls! 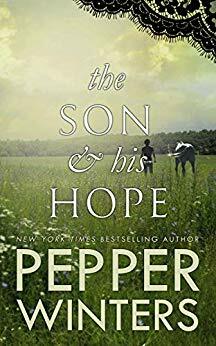 Jacob casts such a lonely figure – torn between finding himself and living up to a promise he can’t break. Pass the tissues! A moving, sad, hopeful and beautiful MM love story that really touched our hearts. Nicola Haken’s writing was sublime, perfectly executed with so much depth and honesty that took our breath away. Many times, we’re told a character is ‘broken’ yet we don’t experience it. 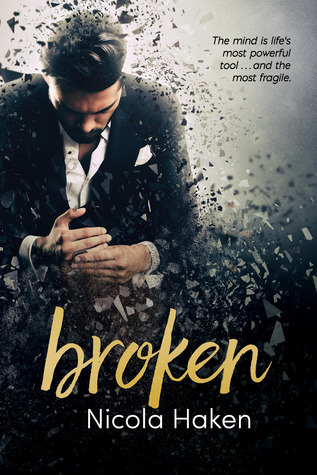 Well, we experienced each powerful moment in Broken, a story we won’t be forgetting in a hurry. 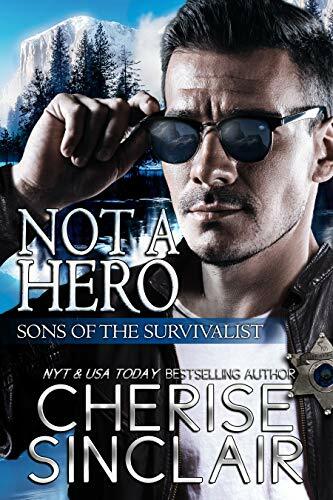 This is our first book by Nicola Haken, and we were completely slayed by James and Theo’s powerful, emotional, intense, sincere and upfront story. A heavy, yet incredibly rewarding read in which Nicola Haken perfectly captured a love story that was as beautiful as it was painful, all done without romanticising James’ mental illness, instead, writing his character with heartbreaking honesty and sensitivity. Paranormal – gripping and passionate vampire series. I’ve really been looking forward to Assail and Sola’s story and as always happens; I inhaled every word as the world was shut out. Whilst yes I loved it, I did feel Sola and Assail took a secondary seat to a new twist in the ongoing saga and the fight which my beloved vampires continue to face. This is book sixteen, so I’m not going to go into story details in this review, you’re either on this journey or you’re not and the diehard’s like me will know what I am on about. So many twists and turns, suspense and angst via the numerous ongoing storylines that make up the whole epic-ness that is the Black Dagger Brotherhood. I can never get enough. Murhder’s story is now next and I’m counting the days because…MURHDER!!!!!! Romantic Suspense Drama – standalone in a series each about a different character. In this first book we meet Gabe, and he’s finding his own peace…with the quiet young woman who seems to have no past. She’s adorable and caring and so very lost. But how can he trust someone who lies to him with every breath she takes? In case you missed it, here’s a round up of the latest books for you, and don’t forget to bookmark our New Releases Page. Wow! Check out the books headed our way this month. If you haven’t already, be sure to check out all the upcoming releases for 2018! Don’t forget to bookmark our Upcoming Releases Page! Thanks for stopping by. Remember if you’re looking for reading inspiration, be sure to check our Recommended Reading Pages. With varied reading tastes, we know there is something on these pages to suit every reading mood!